Whether you play Blues, Rock, or Jazz, learning the Shuffle feel is invaluable. It is easy to learn, fun to play, and will offer many interesting variations. The line I present here is primarily a bass line: the kind that you would generally expect a bass player to play over a basic 3-chord Blues in G.
The emphasis with this 2nd video on the Shuffle will be on picking. 1. Use down strokes only: consecutive down strokes can be challenging because they force us to move the pick quickly from one note to another -- without the help of the alternate picking motion. To make the exercise even more challenging, I also show you how to play the Shuffle using 3 notes per beat, using 8th note triplets. Since there are 12 notes within a measure, we are indeed playing all the subdivisions of a 12/8 meter. Those picking exercises can be counter-intuitive, but they are well-worth the effort. Practicing picking in one direction only will eventually improve your alternate picking down the road. I find that the Shuffle makes an interesting and short study that is way more fun that just playing scales or arpeggios! As usual, work with the metronome, and start very, very slowly. Now that we have mastered our basic Shuffle in G in the original position, we can continue to explore the fretboard, and play those very same patterns, but higher up on the neck. For the G chord: I was playing the pattern following an "E Shape". For the C chord: I was playing the pattern following an "A Shape". For the D chord: I was playing the pattern following a "C Shape". In today's video, I move up the fretboard to the next available positions: For the G chord: I now play the pattern following a "D Shape". For the C chord: I now play the pattern following a "G Shape". For the D chord: I now play the pattern following an "A Shape". Finding those patterns in different places is a great way to learn the fretboard. 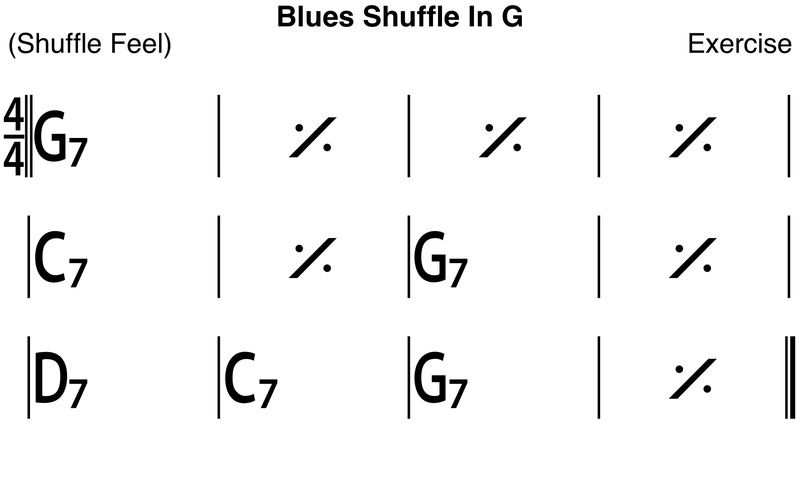 The Blues form gives us all 3 of the important chords for any song (the I chord, the IV chord, and the V chord) and we can learn to connect those 3 primary chords in one same area of the neck, while making music and having fun with the Shuffle. Eventually you can transpose our Blues Shuffle to other keys, and go through the same process. Hint: it is quite easy if you already can do it well in our first key of G.